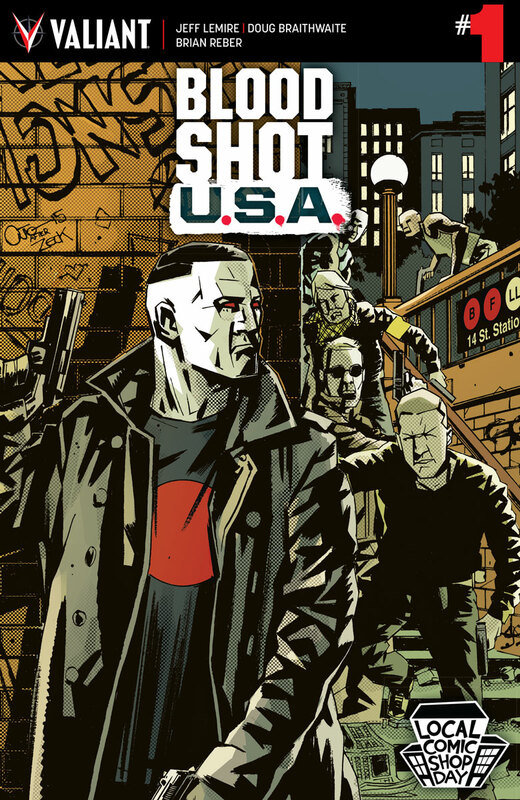 Valiant Entertainment will be supporting Local Comic Shop Day® 2016 on November 19th, 2016 by offering special editions of BLOODSHOT U.S.A. #1 (of 4) – the highly anticipated standalone event by New York Times best-selling writer Jeff Lemire (BLOODSHOT REBORN, Moon Knight) and blockbuster artist Doug Braithwaite (Justice) – and HARBINGER RENEGADES #1 – the all-new ongoing series for Valiant’s subversive teenage superteam by multiple Harvey Award nominee Rafer Roberts (A&A: THE ADVENTURES OF ARCHER & ARMSTRONG) and comics superstar Darick Robertson (The Boys, Transmetropolitan) – to participating retailers! Spotlighting two major releases from “THE FUTURE OF VALIANT” initiative – an all-new wave of ongoing series and prestige projects from the largest independent superhero universe in comics – find out why Valiant has established itself as the most critically acclaimed publisher in comics today with this pair of perfect introductory jumping-on points, available only on Local Comic Shop Day® 2016! Limited to just 1,000 copies, the BLOODSHOT U.S.A. #1 LCSD VARIANT will feature an all-new, never-before-seen cover by renowned artist Antonio Fuso (Cobra), created especially for Local Comic Shop Day® 2016! From the Bronx to Broadway, an unstoppable, nanite-enhanced pathogen is about to turn New York City’s populace against itself…and Bloodshot is the only soldier tough enough to lead a one-man invasion of the city that never sleeps! Join the firefight here as superstar creators Jeff Lemire and Doug Braithwaite unleash a perfect entry point into Valiant’s award-winning publishing line with the self-contained action event of the fall! Then, acclaimed creators Rafer Roberts and Darick Robertson activate the most-demanded, most dangerous superteam in comics in the HARBINGER RENEGADES #1 LCSD VARIANT – featuring an explosive new cover by action-packed artist Stephen Segovia (Action Comics)! They’re in your towns. In your schools. And inside your mind…Now, with a revolutionary upheaval in motion all across America, Kris Hathaway, John “Torque” Torkelson, Faith “Zephyr” Herbert, and Peter Stanchek are about to discover their calling. 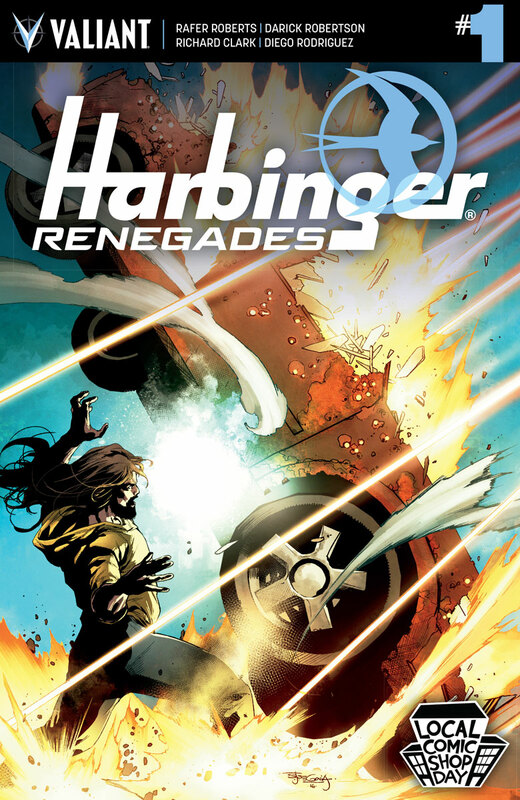 Together, the HARBINGER RENEGADES are moving from town to town, building their ranks, and subverting authority one mind at a time…and setting out to prove once and for all that behind their power, there has always been a purpose. Don’t miss a moment as the Renegades come roaring out of the underground and into the streets for an uncompromising new ongoing series, right here on Local Comic Shop Day® 2016! Local Comic Shop Day® shines a bright spotlight on locally owned independent comic book specialty stores and their role in shaping the pop culture market. This year, Local Comic Shop Day® will be Saturday, November 19th, the Saturday before Thanksgiving. On Local Comic Shop Day®, participating retailers will have exclusive, and in some cases, limited items debuting from supporting publishers. The goal of Local Comic Shop Day is to jump start the holiday buying season for storefront comics specialty retailers by giving comics fans more of what they most desire.